Upgraded wood is so hard to come by these days please don't miss out. 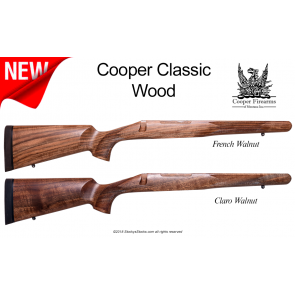 Cooper Firearms of Montana builds some of the finest semi-custom and custom rifles in the USA with their own hand-fitted stocks. We are now making certain models available in limited production runs of AA+ grade Claro and French Walnut inlet for Remington 700® Sporters (BDL, SPS, etc.). Claro walnut is known for its darker color and crotchy figure. French walnut has a lighter base tone with highly contrasting, straight, sometimes feathery grain. French is the rarer of the two. Either will make even the plainest Remington 700® BDL barreled action literally look like you paid thousands of dollars for it. Both uncheckered and checkered versions are available. The optional 4 panel, 3 point checkering is cut by hand at 22 lines per inch before a final, hand rubbed, Tru-Oil finish is applied.